The Belgian magazine Imagine just published an edition with a large piece on Transition. Imagine is a beautifully designed full-colour publication, and you can view a page-turnable online version of it here, but ideally you might support the magazine and buy either a pdf. copy or a printed copy here. Although this will clearly be of more interest in French speaking parts of the world, even as a non-French speaker myself I found it a delight to flip through. but ‘Imagine’ is still a belgian french speaking magazine. 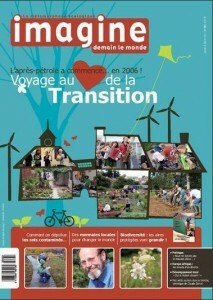 It is true that since this issue of Imagine magazine is released in Belgium, the launch of our transition initiative is easier. When we talk about our project, there are always one or more person who has read the magazine, which is written with enthusiasm and illustrated with nice pictures. The transition movement holds the seeds for a better future. It takes us on the wave of change in the very different fields of our every day lives. The challenge for us is to gain interest and consideration from people who are not directly involved in ecological movements. We are mulling over a transition initiative in our village (Beauvechain), waiting for the seeds to emerge… I would personally like my children and my neighbours to join us on the path of this productive vision of the future. “Le soleil brille pour tout le monde” as we say in French.